The role of faith in working-class families is well-documented. As Robert Jones, the CEO of the polling firm PPRI, has explained it, “Churches have served, for most of the nation’s life, as pipelines to all kinds of civic engagement—and not just because they hand out voter-registration cards or have them in the lobby. We actually see a link between all kinds of civic activity and church activity.”Yet, participation in this once-central institution has declined greatly, with weekly church attendance falling from 40 percent in the 1970s to 28 percent in the 2000s among those with a high school degree or some college (figure 19). 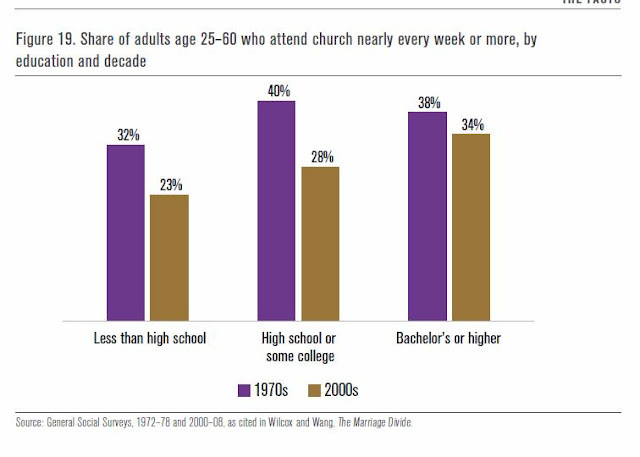 Mirroring this decline in churchgoing, the working class is also participating less actively in other civic institutions (figure 20). According to a PPRI survey, white working-class Americans, which they define as people without a college degree who are paid by the hour or the job, have lower rates of participation in sports teams, book clubs and neighborhood associations than their more-educated peers (30 percent to 49 percent).52 Our definition of working class includes people from all races without bachelor’s degrees, and among them too, rates of civic engagement—participation in service, school or community associations, or recreational or religious organizations—are all distressingly low and more like rates for low-income than high-income adults. 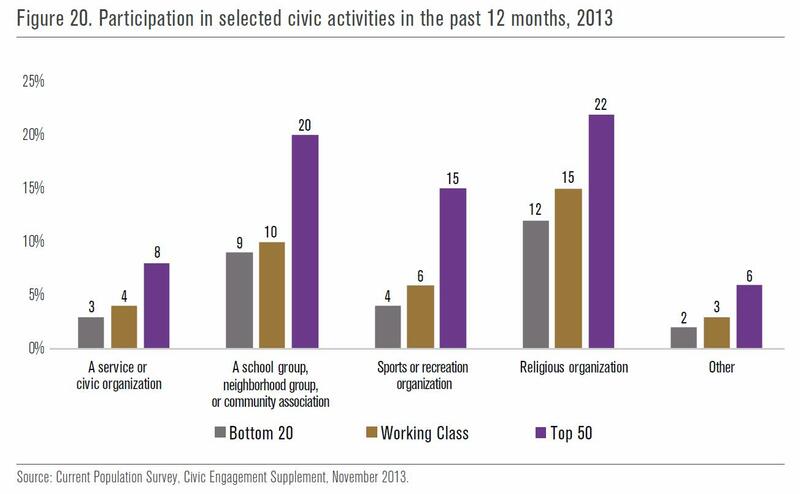 According to data from the Civic Engagement Supplement to the Current Population Survey, no more than 15 percent of working-class men and women participate annually in any of these activities.